The end is nigh! Or rather, the end is here. Drawing AW19 to a close at PFW this evening was Nicolas Ghesquière, who presented his latest collection for Louis Vuitton. For the last time this season, here, dear fashion fans, is everything you need know. ...or did it? Lol, it didn’t. Having staked his claim on the Louvre a long time ago, Ghesquière opted to recreate the brightly coloured pipes and poles of the Pompidou inside the Paris museum for the occasion. There’s extra, and then there’s the AW19 LV show. Dispel any idea that this has anything to do with the rubber ones that basically cut off the circulation to the upper third of your head, though (so not chic). These were high-fashion skull caps, crafted from buttery-soft leather (I mean what else were you expecting? ), as worn by most of the model cast. Ghesquière’s latest offering seemingly channelled the New Romantic movement of the 80s meets Heathers, with ruffled ra-ra skirts and drop-waisted puffball dresses, feminine, prairie-style blouses, amped-up quilted leather accents, and chequerboard motifs all featuring heavily throughout. The mood was further amplified through the models’ make-up, with heavy brows and dark red lipstick on the line-up this season. Having made his debut at last season’s agenda-setting SS19 show, Dazed cover star Krow returned to walk the LV runway again. 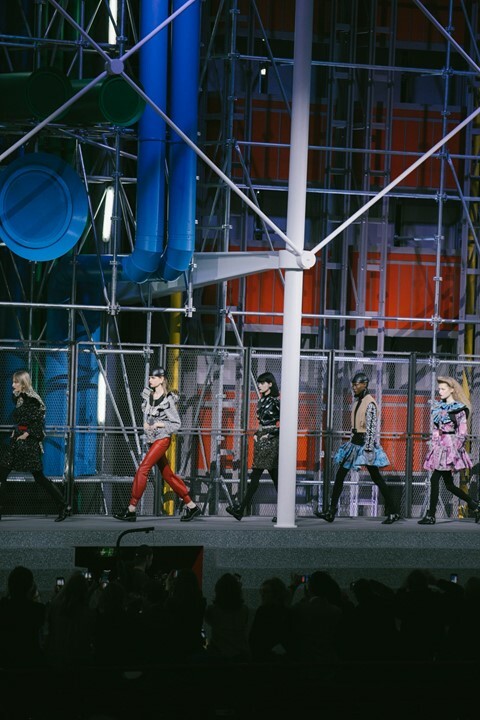 Making his way through the purposely-built Pompidou replica, the model not only brought the show to a close, but the AW19 season as a whole, too. Like we told you: prepare to be seeing a lot more of him in the not-so-distant future.